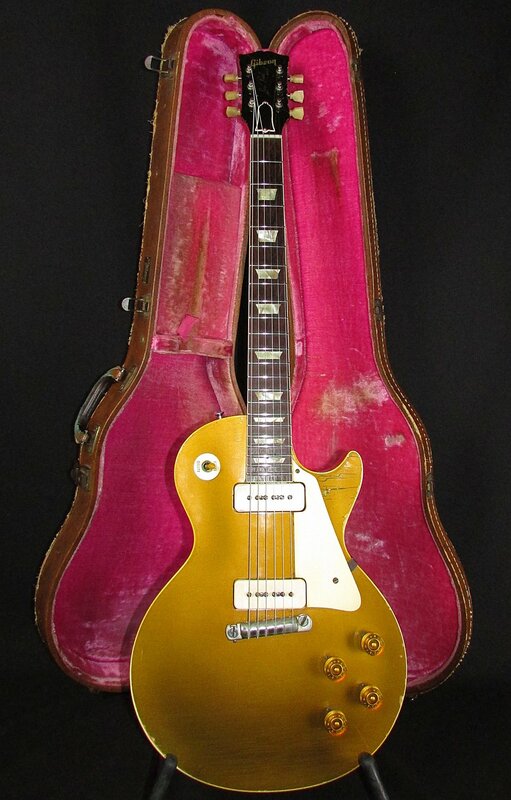 1954 Gibson Les Paul Goldtop, that's right ladies and gentlemen, a real 1954 Gibson Les Paul Goldtop. It's in excellent condition, especially for being 65 years old, and is in perfect playing order. Comes with the original hardcase. This beautiful piece of music history is a seldomly seen gem. It was brought to us from the second owner, who bought it in 1980's from the original owner's family. The original owner lived and played locally in Nashville actively, he also had a local radio show in Nashville and would play this guitar during his radio show. All the wear was caused by the original owner who gigged with it regularly. He played it so much that he had to get it refretted. He managed to put some good wear in the replacement frets as well before moving on from this world. Except for the refret, this guitar is bone stock! The guy we got it from, merely bought it, left it exactly as he bought it in the 1980s, and played it periodically over the last 40 years. On the back of the body, is a hairline crack that travels from the edge of the body on the bass side of the strap button, and runs about to the waist. It appears to have been repaired many years ago, as there is no movement when pressure is applied. The switch has a piece of wood wedged between it and the cavity to keep it stable, it's clear that was done many decades ago by the original owner. Otherwise all the wear is cosmetic and naturally caused. The top has some of the coolest weather-checking I've ever seen! The 1-piece mahogany body is extremely resonant, and the maple cap adds a nice snap of brilliance. The neck is the timeless 50's chunky, subtle V, profile that fits the hand ever-so-perfectly and feels just like home. not to mention the Brazilian rosewood fretboard has some great figuring. The pickups read 8.23k for the bridge and 7.78k for the neck. Has a 1 11/16" nut width, the standard 24 3/4" scale length, and weighs the proper 8 pounds 8 ounces.